South Stream Productions: Reviewers agree - This Doesn't End Well is a hit! At South Stream, we always strive to produce high quality work. And I think we do that. You should take my word for it. But you don't have to. Turns out there's a bunch of folks who are happy to share their opinions on the show. Critics and audiences have been enjoying This Doesn't End Well and they haven't been shy about saying so. So if you are on the fence about buying a ticket - read these reviews! Long time reviewers Martha Keravouri and Chuck Galle at Triangle A&E called it "a lovely and hilariously fun way to start off the New Year." Also at Triangle A&E, Robert O'Connell calls the show a first rate collection of short plays saying "I guarantee that you will be impressed by the writing, the acting, and the staging." 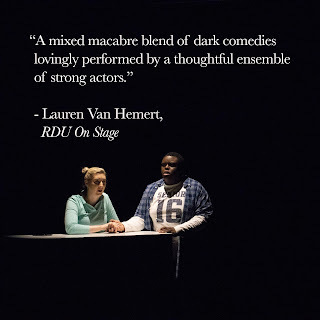 We were the maiden review for RDU on Stage - a new collaboration between Lauren Van Hemert and Kim Jackson. Lauren called the show "A mixed macabre blend of dark comedies lovingly performed by a thoughtful ensemble of strong actors." (that's the blurb you see above). This might be my favorite blurb for the show. We also received a positive-but-not-effusive review from Roy Dicks at CVNC. I appreciate his work, although I disagree with him on some points (of course). But over all he enjoyed it, saying "The evening has consistent laughs (and a few teary moments)." He laughed, he cried... what more do you want? But do you know what the best thing is? The audience reactions. My favorite audience member reactions on facebook were "Go, just go." 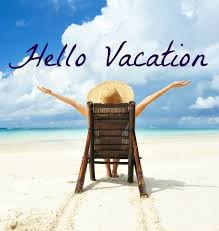 and "See. This. Show."